As part of the Miami Dade Preservation League's programming to mark Miami Beach’s centennial in 2015, Allan Shulman will give a lecture looking at architecture in the city over the past 100 years. The Lincoln Theatre Redevelopment designed by Shulman + Associates was honored as a 2014 Vision Award Project of the Year by the Urban Land Institute (ULI) Southeast Florida/Caribbean. (Perez Art Museum Miami was the co-winner of this year’s award.) ULI criteria required the winning project to “embody excellence in creativity, design, and legacy while making an impact within the community.” Over 600 attended the gala ceremony held at the JW Marriott Marquis on August 27th. Photographs by Emilio Collavino. Five S+A projects have been honored with Design Awards at the American Institute of Architects (AIA) Florida/Caribbean Design Awards Program held this past Saturday. Over 300 anonymous entries were evaluated by a jury based in Ann Arbor, Michigan. S+A was one of 14 Florida/Caribbean-based firms whose 5 projects were part of the total 27 awarded this year. S+A received 3 Honor Awards of Excellence: Baumann Cosmetic & Research Institute for Interior Architecture, the Miami Center for Architecture and Design (MCAD) for Renovation (as Design Architect), and North Beach Tactical Revitalization for Unbuilt Design. Also received were 2 Merit Awards for Excellence: Opa-Locka Airport Hangar 102 for Renovations (as Restoration Architect) and Billboard Building for Unbuilt Design. Super Studio 2014, a collection of the best student work from Architecture and Design Schools from across the South Florida region, opens tonight at the Miami Center for Architecture & Design (MCAD) in downtown Miami from 6pm -8pm. Seven different academic institutions will be represented including the University of Miami, where Allan Shulman is an Associate Professor in the School of Architecture. The exhibit will be open from May 9 – May 30th. Allan Shulman participated as a panelist on the “Miami Architecture Coming of Age” Panel hosted by the Coral Gables Museum this past Wednesday, April 2nd. Moderated by Beth Dunlop, guest curator, architecture critic and author, the expert panel discussed aesthetics, urbanism and Miami’s current obsession with internationally famous architects. Photo (Left to Right): The panel; Jason R. Chandler, A.I.A. ; Allan T. Shulman, FAIA; Beth Dunlop (moderator); Terence Riley; and Denis Hector, LEED® AP. Soho Beach House designed by Shulman + Associates was honored with an award from the Miami Beach Chamber of Commerce, at the 2nd Annual Better Beach Awards. Over 200 attended the award ceremony held at the Loews Hotel Miami Beach last Thursday, March 27. The Soho Beach House involved the restoration of the 1942 Sovereign Hotel and the addition of a modern 15-story tower on the ocean. Photo (L to R): Jury head Reinaldo Borges, AIA; MBCC Chair Michael Goldberg; Allan Shulman, FAIA; MBCC President Jerry Libin; Miss South Beach Melissa Barragan-Shaw. Panel discussion moderated by Beth Dunlop, with Jason Chandler, Denis Hector, Terence Riley and Allan Shulman. This Wednesday, April 2 at 7:00 PM at the Coral Gables Museum. LUXE Interiors + Design South Florida featured the firm’s Colee Hammock House in their Winter 2014 issue. Located in a lush natural oak grove, this home offered S+A ample opportunity to explore the themes of Tropical Architecture and modernism within everyday livable spaces. Come out and see the work of S+A’s 2012 Art Basel Installation artist Brian Butler for Double Vision: his joint exhibition with Jaime Salazar of drawings and photos taken throughout Miami’s music scenes. Check out more of Brian's work here and images from his show at S+A here. Jason Walker, Director of Graphic Design at Shulman + Associates was named a 2014 DCOTA (Design Center of the Americas) Star of Design in the field of graphic design. At the awards ceremony DCOTA said his “fresh, relevant work has given S+A a strong graphic identity and fostered the connections among architecture, art and graphic design.” Congratulations Jason! Photo courtesy of DCOTA. On January 30th, Baumann Research & Cosmetic Institute partnered with The Florida Grand Opera and Shulman + Associates to present the beauty of architecture, art, music and science together in celebration of the 1 year anniversary of the award-winning Baumann Research & Cosmetic Institute designed by Shulman + Associates. Photos by Silvia Ros. Check out The Architect's Newspaper's coverage of the Miami Center for Architecture & Design's inagural exhibit, Drawn From Miami, here. Exhibition curated by S+A principal Allan Shulman, Terence Riley, Jake Brillhart, Nick Gelpi, and Jean-François Lejeune. Photos by Robin Hill. Cover Story: Shulman + Associates of Miami designed a beauty of a house for the heavily canopied Colee Hammock neighborhood in Fort Lauderdale. In an article called "Site Specific" we talk to architect Allan Shulman about the project. Photos by Robin Hill. Walk with us through that Shulman-designed residence. Through the low front entry, descend the stairs into an open pool courtyard and walk over the pool and into the front door. Air, water, light, shade, breeze, scent, shelter... it's all there in one place. Check out the New York Times interview with S+A principal Allan Shulman, FAIA, with his thoughts on Miami, its future and the recently-opened Miami Center for Architecture & Design here. A completed MCAD (S+A, Design Architect, Forbes Architects, Architect of Record and Contractor) is featured in Architectural Record. See photos from the opening night of both the Center and its inaugural exhibition, Drawn From Miami, here. After over 3 years of rigorous planning and creating partnerships, Miami will be joining other major cities such as New York, Chicago and San Francisco, that support these successful centers. Located in the heart of Downtown Miami in the old post office building , circa-1912, the historic landmark will also be the new home of the Miami Chapter of the American Institute of Architects. Shulman + Associates is the Design Architect for MCAD and Forbes Architects is the Architect of Record & Contractor. Shulman + Associates invites you to experience its latest exhibit design Bob Marley Messenger at HistoryMiami, on display from October 11, 2013 - January 5, 2014. The exhibit uses artifacts, photographs and interactive elements to explore the man, the musician, and the legend. S+A’s design enhances the exhibit’s themes, transforming Marley's messages into space and creating a textual backdrop. The collage of media is modulated by a neutral dark-gray backdrop that pulls vibrant Rastafarian colors and rich black and white photography into relationship. Opening celebration is on Thursday, October 10, from 7PM - 9PM at HistoryMiami, 101 West Flagler Street. Bob Marley Messenger, on display from October 11, 2013 - January 5, 2014 at HistoryMiami. Exhibit design by Shulman + Associates; exhibit curated by The GRAMMY Museum® at L.A. Live. The Lincoln Theatre/H&M has been honored with the 2013 Award of Excellence for Historic Preservation and Renovation from the American Institute of Architects Florida. The historic theater’s restoration and adaptive use was designed by S+A, Design Architect for the project. The design provides state-of-the-art retail facilities while propagating the building’s history as a public space and as a theater and acknowledging its cultural position on Lincoln Road. The Lincoln Theatre project with H&M as a major tenant was developed by Cliff Stein of Savitar Companies. The Design Architect was Shulman + Associates. The Architect of Record was Kobi Karp Architecture & Interior Design and H&M’s Architect was Taylor Associates. 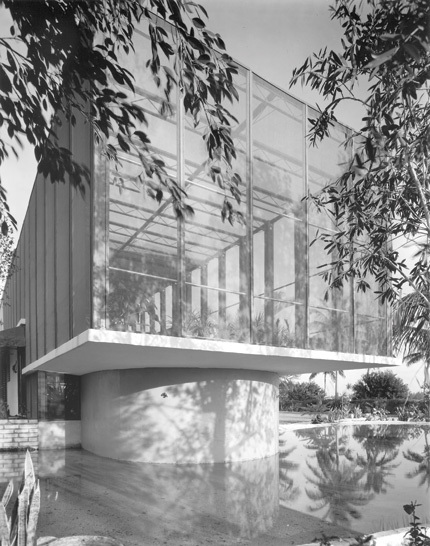 Heller Residence #2, "Birdcage House," Igor Polevitzky, architect, 1949.